According to Jack Neff’s recent Advertising Age article, Zhu Zhu Pets may have helped the battery category through the holidays, but it may not be the only thing powering the category. On a recent trip through Walmart I was struck by a display of Energizer batteries. As a household with three kids, we go through a lot of batteries. Why we don’t use rechargeable, I’m not sure. But that is for another posting. At any rate, I was struck by what I perceived to be the level of Energizer’s commitment to Susan G. Komen charity for breast cancer. Of course you’d have to live under a rock not to have noticed all of the pink product promotions during Breast Cancer Awareness Month (October), but this seemed special. 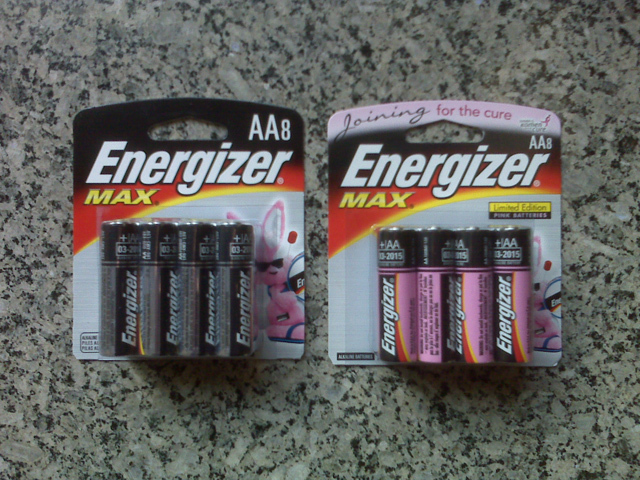 Certainly the Energizer bunny was pink and the package was pink, but the batteries themselves were also pink! With most products promoting breast cancer awareness, there is an limited-time package and that’s it. For that matter, most NFL football teams had some level of “pinkness” during the month of October. Throughout the month, NFL games featured players, coaches, cheerleaders and referees wore pink game apparel to raise awareness of the disease. The next month it was back to normal. In both instances, the focus seemed to be on the “first-moment-of-truth” as Procter & Gamble refers to the shelf experience. But batteries are different—especially pink batteries. The unique thing about the category is that while the shelf experience is important, so is the “second-moment-of-truth.” From a brand perspective, marketers want to make sure that the consumer experiences the brand outside of the store—in the home or elsewhere. Batteries are uniquely suited to deliver. Batteries can potentially make a much more lasting second-moment impression, and so too can a battery promotion. I find myself sifting through the battery bin stored in our laundry room at least once a week. We also keep batteries in a family-room cabinet and in a few drawers. I imagine that when the pink batteries I purchased run out in our flashlights, wii controllers, television remotes and holiday gifts (we did not buy any Zhu Zhu Pets this year), I will once again be made aware of breast cancer and the Susan G. Komen charity. Now that’s some power of inspiration! By the way, in most of the world a pink battery bunny is associated with P&G’s Duracell brand. 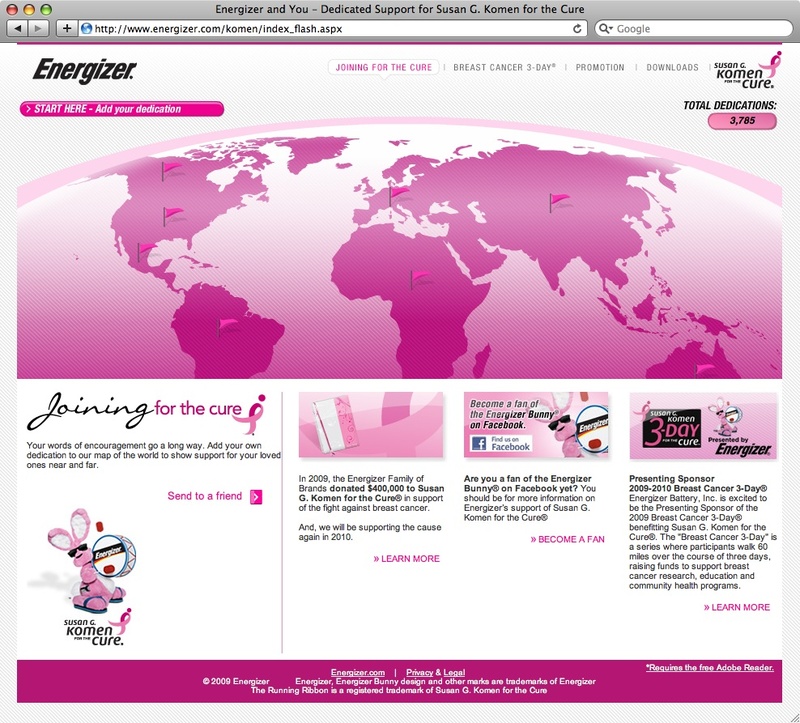 Only in North America does the Energizer bunny keep going, due to Duracell’s failure to renew the US trademark. Energizer battery sales are declining in share and volume per their annual report for 2009. Breast Cancer bandwagon is pretty full. May do better to promote to men and women with a more inclusive charity. Question is would you pay more for the pink batteries? na…. Good call Patrick! I fully agree on both points. But, I wager it isn’t just whether or not you’d pay more for a pink battery, but whether you’d chose a battery (or any consumer product) that promotes your cause over another one. The category as a whole has seen better days. That’s part of Neff’s point in Ad Age. As he states, “Alkaline batteries had their best quarter for volume growth in at least three years and their first positive holiday quarter in terms of volume in four years.” Clearly not all due to the sluggish economy, this is a category that is scrapping for life. Can promotional campaigns alone solve the category’s problems? Probably not. Can we learn something from a promotional package or product that lives beyond the first-moment-of-truth? Most certainly!